Will 'stair snacking' be the next fitness craze? Feb. 7, 2019—If you can find a few flights of stairs where you work or live, you can find time for fitness. A new study found that peppering your day with brief stair-climbing sessions can be a heart-healthy workout. The research focused on a type of exercise called sprint interval training, in which people do short bursts of intense exercise. Previous research has shown that about 10 minutes of vigorous stair sprints can help people get fit. But for this study, researchers wanted to know if climbing stairs for only a few minutes at a time might also work. To find out, they had sedentary adults hustle up and down three flights of stairs three times a day, three times a week. After six weeks, the stair climbers had better fitness and strength than a control group of people who did not exercise. The study's findings are good news. They suggest that you can boost your health as you go about your day. One of the researchers said that's like fitting "stair snacking" into your schedule. You might not have time for a lengthy workout, just as you might not always have time for a big meal. But you might have time to climb a few flights of stairs on a coffee or bathroom break. The study appears in the journal Applied Physiology, Nutrition, and Metabolism. The study's findings echo the U.S. government's latest physical activity guidelines, which call for Americans to move more and sit less. Those guidelines state that any amount of movement is better than none, even if you move for less than 10 minutes. But to reap the most benefit from exercise, most adults should aim for at least 150 minutes of moderately intense aerobic exercise (such as brisk walking) weekly, or 75 minutes of vigorous activity per week. 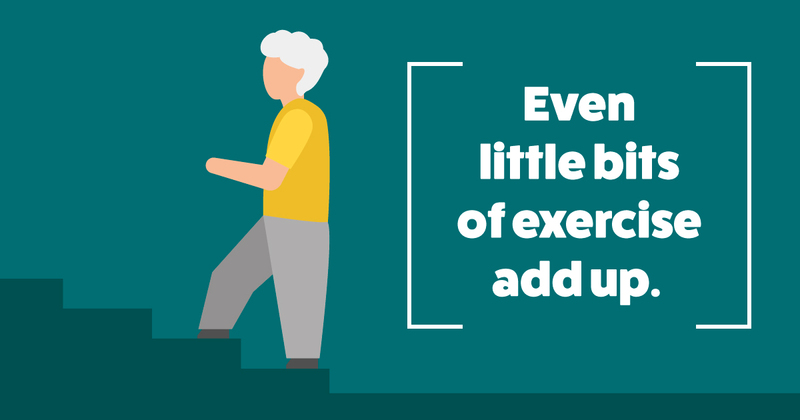 Frequent bouts of exercise (like climbing stairs) throughout your day can help you meet either of those goals. But if you're not used to exercising (or you have any health problems), you might want to check with a doctor before trying something vigorous, like stair sprints. Visit our Fitness and Exercise health topic center.